Best of all, six decades into the game, Corvette remains a highly athletic and competitive machine that’s still comfortable to use on a daily basis, part of the reason I guess it’s favored by older dudes. While the seating position nearly scrapes the pavement, it’s relatively easy to get in and out of and the plush leather racing seats are quite accommodating, even on longer rides. For 2013, the diamond anniversary brings a variety of special anniversary designs to the otherwise mostly unchanged ‘Vette lineup: a sparkling Arctic White paint job, racy blue stripes and navy blue leather interior of my Grand Sport convertible this week made folks think I was driving the considerably more intense, limited-edition 427, but I went along with the ruse and enjoyed it nonetheless. Grand Sport is an improved, widened and more track-tuned version of the base Corvette, with a 430-horsepower 6.2-liter V8 LS3 engine given a tad more breathing room with a dual-mode exhaust system (boosting the horses to 436 and the torque to 428 lb.-ft.). The odd part about that system is that you can drive the ‘Vette up to about 45 MPH with nary a sound at all, sticking it silently to a series of windy mountain roads or cruising around town. I needed to get the pedal mashed about three-quarters of the way to the floor to open the floodgates to that rip-roaring, old-school exhaust note – and head-snapping, 0-60-in-less-than-four-seconds blast of power). Drive it in that sedate fashion and it will get up to 25 MPG highway. Mine also featured a mostly amenable six-speed automatic transmission with thumb and forefinger-activated paddles on the wheel (which I could not readjust my brain to using properly during a two-day test period, as they’re the opposite direction of other carmakers’ systems). But third gear was a happy medium during my romp on Mt. Evans, even if downshifting into second did produce a slightly mechanical noise before the big and satisfying throaty blurt. And considering the very light Corvette literally jumps sideways with every full-throttle upshift, I think the system does pretty good. 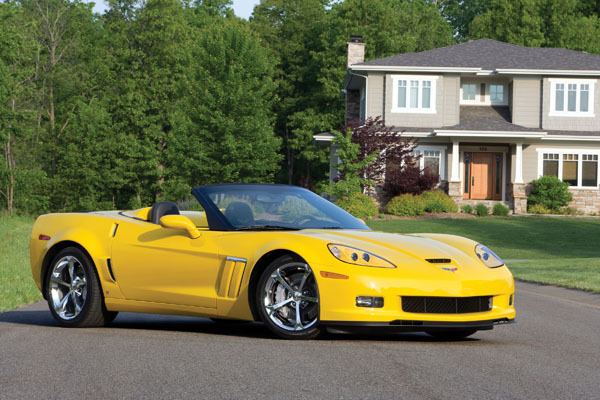 Everything they say about Corvette’s handling is also absolutely true, and can be enhanced with the optional magnetic ride control package mine had: Without trying particularly hard, the car will pull almost a full G on a corner, with that wide-set track and super-fat 18- and 19-inch race tires. You’re thoroughly sucked into your seat while this happens, and I can only imagine how intensely the car would respond to full-blown track racing. The Grand Sport adds extra brake-cooling vents on the body and those brakes are a bit bigger (14 inches in the front, 13-plus in the back). And they work. You forget how wide the car is, as well, until you sit down and drop the top and take off – more like an open cockpit race car than the upright and frankly claustrophobic experience of the Camaro or the Mustang. It takes up a whole lane, something you have to remember as you roll along. Yes, if you’re a European or Japanese high-end enthusiast, Corvette’s interior may be a sticking point, but those kind of people aren’t going to be buying Corvettes, and those who do will think the details are quite nice – though almost entirely unchanged for the last few years. The anniversary blue leather is attractive and is highlighted with offset stitching and the optional suede package adds a grippy element to the wheel, shifter, e-brake and door pulls. The navigation’s old-school but it works and OnStar has got the traffic and weather highlights for you, plus turn-by-turn verbal navigation; the Bose stereo system’s great for rockin’ out to the oldies and will noise-compensate when you drop the top. The stripy paint job on my white special edition does carry right into the cabin where the hard top covering the soft top sits at your shoulder, looking just a bit like it came from Luke Skywalker’s landspeeder. For real. $78,500, with lots of options, but no 505-horsepower engine? That’s the math you’ll have to do. Very pretty, in the meantime.